Ray Hudson was born March 24th, 1955 in Gateshead, England. He signed with local side Newcastle United in 1973 at the age of 17. He made over 40 appearances for the club and fans there nicknamed him "Rocky." After four years in the Football League First Division, Ray moved to the United States, playing for the Fort Lauderdale Strikers of the NASL from 1977 to 1983 and was named an All-Star five times. He played the winter season of 1983-84 in Germany with Union Solingen, making 10 appearances without scoring. Ray also played for the Strikers following their move to Minnesota in 1984, which proved to be the NASL's final year. During his stint with the Strikers, he scored 44 goals in 197 matches with 99 assists. He followed this with a season playing for Edmonton Brickmen before joining the American Professional Soccer League to play for the Fort Lauderdale Strikers in 1988 and 1989. In 1990, he joined the Rowdies, former Coach Gordon Jago tried unsuccessfully to lure Ray away from the Strikers in 1980, right after he had captained them to Soccer Bowl '80, against the New York Cosmos. "Jago offered me a great deal, but my loyalty was with the Strikers," Ray said. "I hope it's a case of better late than never." Ray would appear in 13 games, scoring 2 goals and 1 assist for the Rowdies. After starting out as the Miami Fusion's community outreach director and TV commentator, Ray was named its head coach in the middle of the 2000 season, finishing the season with an 11-12-1 record. He led the club to the best regular season record in MLS (the MLS Supporters' Shield, the equivalent of a league championship in European leagues) in 2001 with 16 wins, 5 losses and 5 draws. However, the club was defeated by the San Jose Earthquakes in the semifinal round of the playoffs. He quickly became known for his fiery personality. One memorable incident occurred after a Miami home win against the Tampa Bay Mutiny. The Fusion scored five goals, an offensive outburst for soccer, but Ray was apparently unsatisfied. He stormed into the media tent and up to the podium. He said, "I've got nothing to say. Any questions? ANY QUESTIONS? No? OK!" and stormed right back out. Interviews with players after the game indicated that Ray was angered by a perceived lack of effort, even with the Fusion's dominant win. Following MLS's contraction of the Fusion, Ray was hired to replace his friend Thomas Rongen as head coach of D.C. United on January 8th, 2002. He continued to regale fans and journalists with his wit, stories, and quotes. He once famously said, "There’s a lot of talent on this team, and I’m talking Anna Nicole Smith type of talent!" upon taking control of the team in 2002. He worked for ESPN's World Cup coverage in 2002, and came up with a memorable quote after the American team drew 1-1 with South Korea in group play. Expounding upon whether U.S. goalkeeper Brad Friedel should be thanking his defenders for their works, he said, "I'll be kissing their bums in the showers." Despite his personality and love for the home fans, United finished at the bottom of the table in the East in 2002 with a record of 9-14-5, and were ousted in the first round by Chicago Fire by a 4-0 aggregate score in the two-game series in 2003. "Someone get me a blindfold and a cigarette!" he said during the post-game news conference. He was replaced by Peter Nowak in 2004. Ray's cumulative record as an MLS head coach stands at 46-44-20. 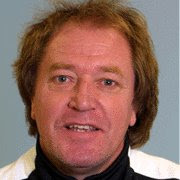 Beginning with the 2004-2005 season, Ray Hudson began TV commentating for GolTV. He is a color commentator for European league matches and was a co-host of American Soccer until his final (to date) appearance on the show on August 29th, 2007. During the 2006 World Cup, he was a co-host for the English-language segment of the nightly Gol TV En Alemania wrap-up show.